This post was to list things I carry in my billfold with the title 'Things,' but hearing a radiolab.org episode with that title, I decided to broaden it and find my own title. Listening to that radiolab (link below) gave me some great ideas about the connections of things and how much people differ in their ideas about what to keep. For example, one participant, a journalist, talked about receiving an email from Neil Armstrong, the first man to walk on the moon. He was happy to get the email, but it was not something he saved, because Neil hadn't touched it. He maintained email is sent machine to machine to paper, which gives it no personal value. That's the simplified version. His feelings were more nuanced. He has a point, but it wasn't agreed upon by the others. I couldn't help but compare his thoughts with the idea of six degrees of separation -- the unproven theory that everyone in the world is connected by six or fewer steps to any other person in the world. Also in the same episode was the description of a trek in Utah, in the desert, sandstone cliffs, canyons. While climbing from mesa to mesa two of the climbers found a red 'seed jar' that had probably been hidden there by its owner thousands of years ago. It had obviously been valued because it had been repaired with a kind of lacing to keep pieces together. The dilemma for the two men who found it was: should they leave it there or take it with them? When the one (pregnant) woman was brought to the scene she took a picture of it and said, "Leave it" -- not quite that abruptly, they discussed it at length. Pot hunters would take it. Eleven years later they went back to look for the seed jar, children and all. It was a strenuous trek, and when they finally found the place, the whole wall of the mesa had fallen, so the jar was lost in the dust and sharp rocks left by the disintegration of the cliff. I don't think any decisions can be made using this event as an example. The dilemma remains. Ah, there it is -- that elusive title. The things I kept have no value to anyone else, no monetary value except for the MGM Hotel key, one of which is on eBay now with a high bid of $49. I'm not a traveler and I'm not particularly sentimental. I had to search for things I have kept and am somewhat surprised at how many there are, many more than are listed here. Most of the items were touched by other persons involved, but I didn't place a fine point on that. Most of them are incidental, not items I planned to save until the end of time, just items I find difficult to discard, items I can hold in my hand to help me remember. a silver book mark from Recording for the Blind and Dyslexic -- for reading one thousand hours. 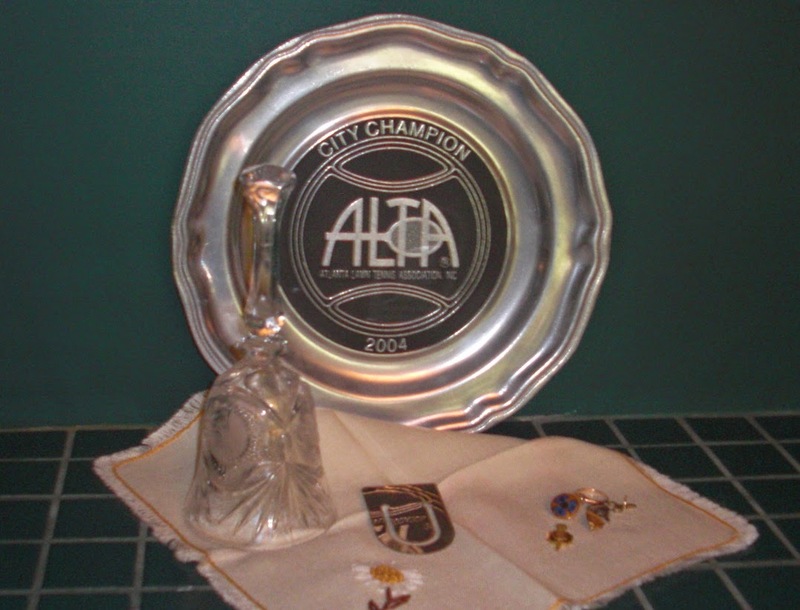 Amy's 2004 ALTA first place trophy. a Winnie the Pooh quote cut from a magazine article about A. A. Milne. "When you wake up in the morning,Pooh," said Piglet at last, "What's the first thing you say to yourself?" I wrote "Say when!" on it and put it in a friend's mailbox. the 3X5 card where I wrote out Wes's dictation in red Magic Marker, "Whoever makes a mess, has to clean it up dey own self." It was on the refrigerator for years. a five-dollar bill, gift from my college roommate's mother when she was in the early stages of dementia. She was remembering our college days when I needed money. my ticket stub from the January 1, 1981, Louisiana Superdome, 47th Annual Sugar Bowl Classic -- when Georgia beat Notre Dame for the National Championship. Very wrinkled! a Las Vegas MGM Grand Hotel key. I didn't mean to 'steal' it. The hotel burned to the ground in November, 1980, killing eighty-five people. a rejection slip from Redbook for one of my stories. I have many, many rejections slips, but the Redbook Fiction Editor had written a very encouraging personal note on that rejection. my grandfather's obituary. He emigrated from Norway and settled in Minnesota, a blacksmith, one of the last. 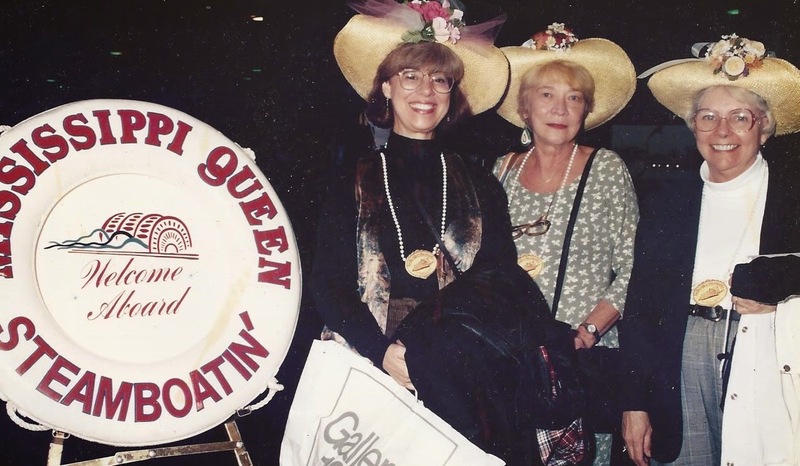 Jo, Marge & Chris - What a trip!!! the book, The Mystery of the Gingerbread House. one for our daughter, Julie Beth. She was almost eight when she died. She was reading the book,The Mystery of the Gingerbread House, by Wylly Folk St John. Amy finished it for her and discovered that the gingerbread house in the book was a real house, and that it was in her neighborhood in Atlanta. Gingerbread in that sense meant the Victorian style wood cutouts often found on old houses. Amy kept the book. It is my treasure now. Stop and take your hands off the keyboard or your thumbs off your iPhone and look away from this moment to take a mental inventory. What 'things' did you keep? This was a happy/sad post for me, but I'm glad I took the time to look for these treasures that are right at hand.